Yoda is one of the most prolific Jedi Masters to ever come out of the Order. Now, you can become this great Jedi with these Yodi costumes and accessories. Are you in need of a vinyl mask? No problem. Searching for a toddler costume? You can stop looking. Do you yearn for a Force FX lightsaber? Look no further. 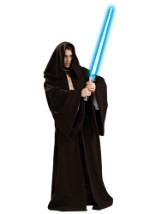 Plus, these officially licensed Star Wars costumes and accessories come in several styles and sizes.